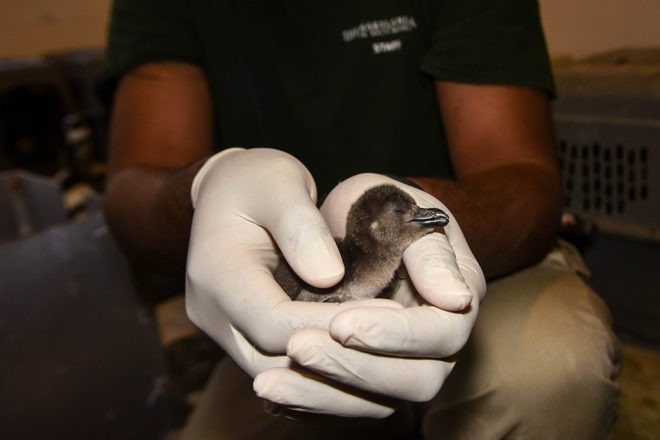 1000th African Penguin Chick Hatches at The Maryland Zoo! The Grand Chick Count makes it official — 1,000 African penguin chicks have hatched here over the past 50 years! Many of these penguins have helped establish new colonies at zoos and aquariums around the world. African penguins from the Zoo have moved to zoos and aquariums in 35 states and six countries including Canada, the Netherlands, Spain, Italy, Hungary and South Africa. Did you know? African penguins are endangered in the wild and some scientists believe they could become extinct in our lifetime. We are committed to finding ways to save these animals from extinction. If you’d like to help us help the penguins, click here to donate! The Maryland Zoo in Baltimore is thrilled to announce the hatching of their 1000th African penguin chick! This historic milestone marks the first time that any zoo or aquarium in North America has hatched 1,000 African penguin chicks! 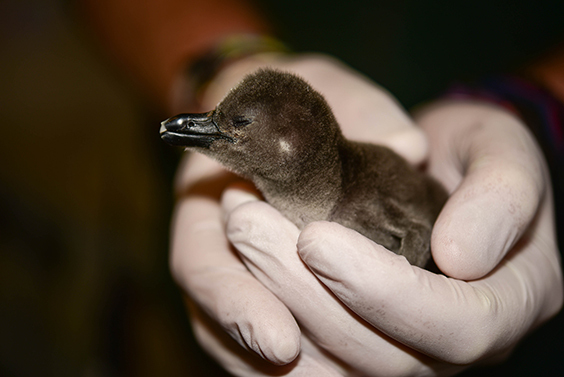 The chick, the thirteenth to hatch at the Zoo during the 2017-2018 breeding season, hatched on February 13, 2018, and is being parent- reared behind-the-scenes in the Penguin Coast Conservation Center. The Maryland Zoo has been a leader in African penguins for 50 years, winning the prestigious Edward H. Bean Award for the “African Penguin Long-term Propagation Program” from the Association of Zoos & Aquariums (AZA) in 1996. The Zoo currently has the largest colony of African penguins in North America. 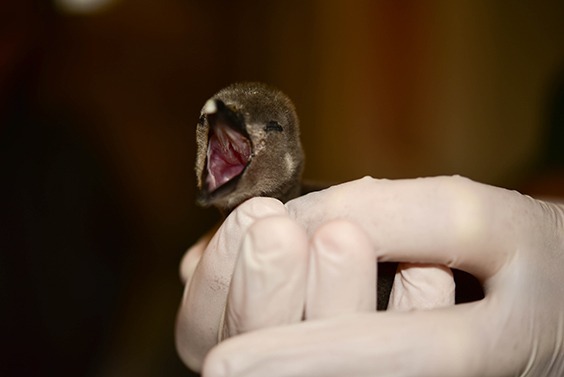 “This chick is not only the 1000thto hatch, it also becomes the 94th in our Penguin Coast colony,” said Jen Kottyan, avian collection and conservation manager. “Our penguins are bred according to recommendations from the AZA African Penguin Species Survival Plan (SSP) which helps maintain their genetic diversity. Many of the penguins previously bred at the Zoo have helped establish new colonies at zoos and aquariums around the world.” Penguins from the Zoo have moved to zoos and aquariums in thirty-five states and six countries including Canada, the Netherlands, Spain, Italy, Hungary and South Africa. At Penguin Coast, chicks stay with their parents for about three weeks after they hatch and are fed regurgitated fish from their parents. During this time, zoo keepers and vets keep a close eye on the development of the chicks, weighing and measuring them daily for the first week to make sure that the parents are properly caring for each chick. When a chick is three-weeks-old, the animal care staff remove it from the nest, and start to teach the chick that the staff are the source of food. This step is critical as it will allow staff to provide long term care for the birds including daily feeding, regular health exams and both routine and emergency medical care. 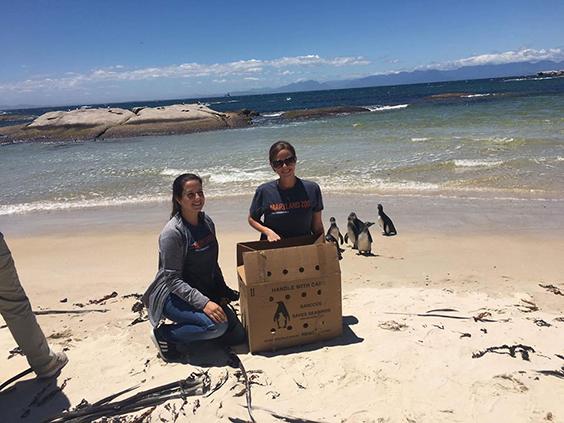 During the past couple of years The Maryland Zoo has sent staff to South Africa to work with the South African Foundation for the Conservation of Coastal Birds (SANCCOB) and other conservation partners. “Two of our staff spent a couple of intense weeks in November at the SANCCOB facility in Cape Town in their chick bolstering areas, caring for chicks which had been abandoned by their parents. They were also able to participate in releasing penguins back to their wild colonies. Another staffer spent a couple of weeks in South Africa with our partners tagging penguins in the wild so we can better track them through their lives,” continued Bronson. In addition, two Zoo staffers are individually spearheading projects which are part of the AZA African Penguin SAFE program — the Disaster Relief and the Marine Movement Programs. The Disaster Relief program involves working with organizations in-country to formalize a disaster management plan for the individual penguin colonies in South Africa. This includes devising training protocols that will be needed to train first responders and volunteers, using an Incident Command System similar to that used in the U.S. and other countries, as well as working with Port Authorities to ensure involved companies are compliant with the laws and find ways to engage them in the conservation of the penguins. The Marine Movement Program is designed to monitor marine foraging and movement patterns of African penguins in-and-around breeding colonies in South Africa. The goal is to learn how the penguins are hunting and orienting in open water as well as how they navigate and return to the nesting sites (via cameras which are attached to several penguins for short periods of time.) This project could have a huge impact on how the government in South Africa collaborates with the fishing industry. “We will continue to focus on providing the best care possible for the birds in the colony, but are excited to broaden our conservation efforts to help save this very beloved, yet endangered species,” concluded Kottyan. For updates on the historic 1000th chick in the weeks before its public debut, visit the Zoo’s Facebook page at www.facebook.com/marylandzoo.